As part of our family tradition on Sundays, we love to try new places for breakfast/brunch. M and I work a lot, so Sundays are designated for "Family Day" for the three of us to spend quality time with each other. I have heard so much about Fig Tree Cafe... a farm-to-table restaurant, utilizing local and fresh ingredients. Their brunch menu offers yummy benedicts, omelets, french toast, sandwiches, salads and organic coffee and espresso. Let's start off with what we ordered for our little boy. Half order of their super delicious french toast ($4.95). 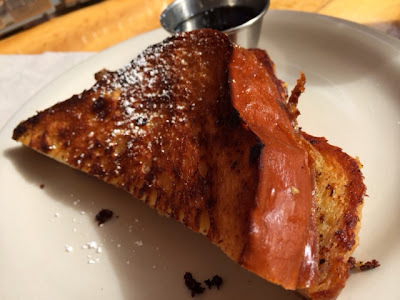 A half order comes with two pieces of griddled french toast and orange segment syrup. He either was really hungry or he just absolutely loved every bite. He devoured this very quickly, even after snacking on crackers at the table. This picture looks like only one piece, but there's another piece behind it. I had to take a picture really fast because he was ready to eat! 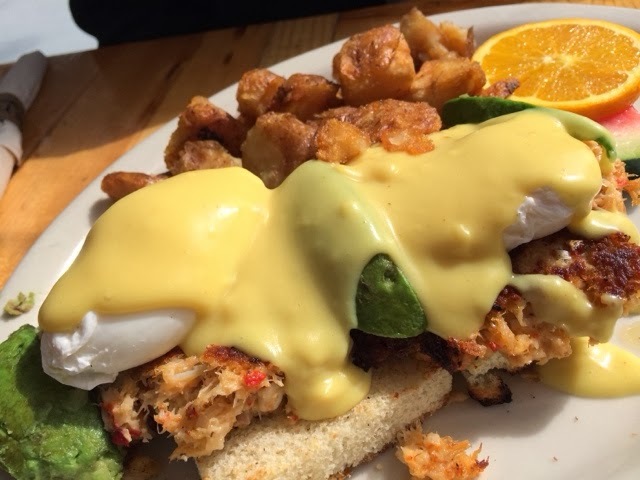 M ordered the Housemade Crab Cake and Lobster "Bennie" ($14.75) with a side of sliced avocados and tomatoes (additional $1.99). This was super delicious. The lobster/crab cakes were huge and the portion size of the entire plate was really big. 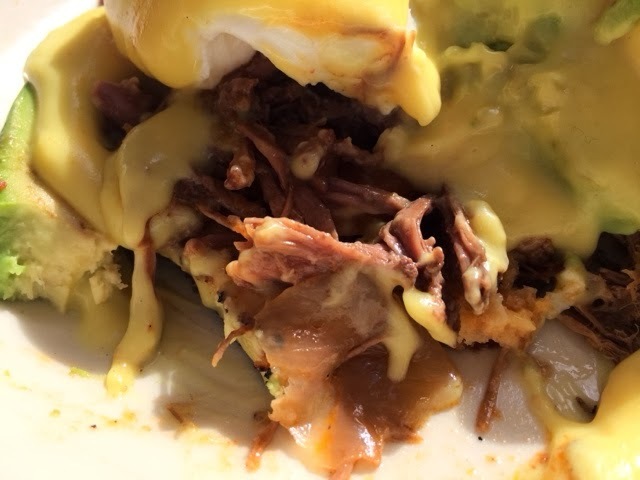 I read on Yelp that these bennies are good to split, but of course, we listened to our stomachs and what we ended up with was a TON of leftover food. *sad face* Lesson learned. I could not resist ordering the Braised Angus Beef Short Rib "Bennie" ($12.95), and added a side of sliced avocados and tomatoes too ($1.99). Just like the South Beach Benedict at World Famous, I love the combination of these two on my benedicts. Holy moly... I told you, my bennie plate was a ton of food. The hollandaise sauce was rich and perfect. The braised short rib melted in my mouth and the potatoes were perfectly crisp. We all could agree that this was a super hefty plate of food for a Sunday brunch. 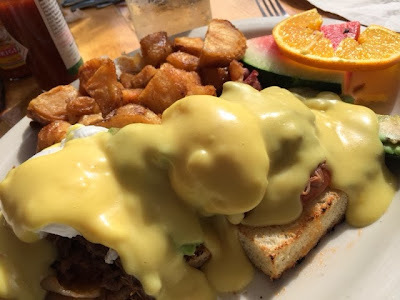 My hubby and I vowed to always split a benedict here from now on and possibly get a full plate of their fabulous french toast to share as a family. 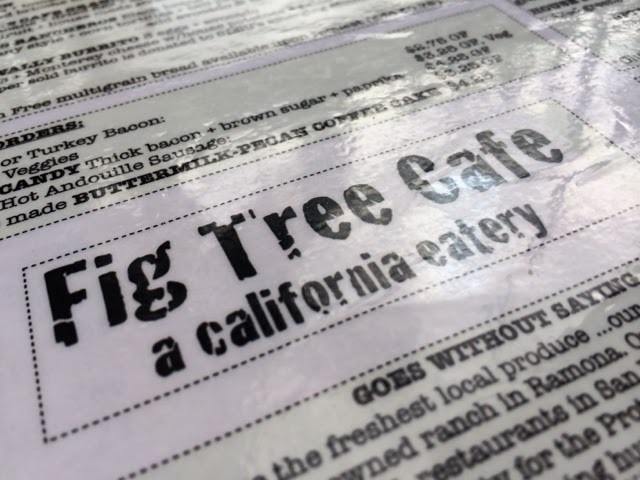 The Fig Tree Cafe has awesome food and they have a lot of beverage options too! I commit to only one cup of coffee a day, so I did not have one of their organic, fair trade coffees, which I will have to go back for. Oh yeah, they also have "Man Candy" on their menu.... thick slices of bacon with brown sugar and paprika. What? Yum! I wish I could try everything here! We'll be back for sure.